True Hope and a Future: UNQUENCHABLE - a giveaway! It only takes a moment to change your life forever. If you've ever experienced one of these moments that rocked your world and caused you to question your faith, or if you wonder whether your faith could withstand such a crisis, then this book is a must-read! 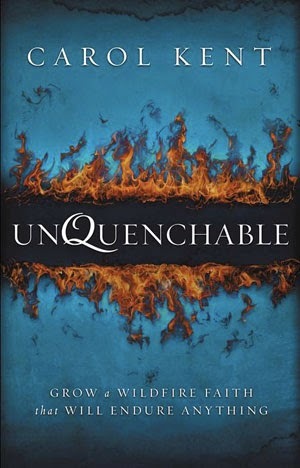 UNQUENCHABLE - Grow a Wildfire Faith that Will Endure Anything is the latest book by author and speaker Carol Kent. Through her own story and those of others, Carol gives an honest portrayal of the struggle to cling to faith in the wake of unthinkable tragedy and reminds the reader they are not alone in their trial. The narratives shared in Unquenchable cover such a wide range of situations that every reader will either have an account they can relate to or will come away with the realization that there are other people who've made it through situations far more difficult than their own. These portrayals break through stereotypes and allow the reader to see the real people behind the labels they've been branded with. Carol asks and answers the question forefront in one's mind when experiencing a crisis of faith, "Is it a failure when the challenges of life seem to douse our feelings of closeness with God and deaden our senses for the One who created us, saved us, and offers the power to sustain us? No, I don't believe that it is failure at all. We must never confuse feelings with faith. When feelings wane - and they will, for all sorts of reasons - we must stir through the ashes to reveal the embers of our still-living faith." 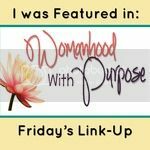 "When bad things happen - or when I'm hurt, offended, misunderstood, or even simply discontent - I can know there are spiritual rewards that will serve me well and enable me to impact the world in ways I never otherwise could have." Unquenchable is a worthwhile read for all Christians, and the discussion questions at the end of the chapter make it great for Bible study or recovery groups. Best of all, Carol has given me a copy of the book to give away! Winner will be announced on Thursday, March 13 so enter now! * I was given a digital copy of Unquenchable to preview, but all opinions are strictly my own. I heard Carol speak shortly after her tragedy occurred. I was bawling. She is a woman of faith and her words always encourage. I would love to read this book as my one word for 2014 is "Faith" :) Thank you for the opportunity! Blessings! This book sounds like everyone might discover themselves inside its pages. Thank you for sharing with us here at "Tell Me a Story." 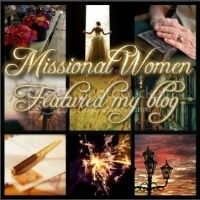 "I've always felt comfort in knowing that, as a Christian, my suffering is never wasted because God can bring good out of even the most horrific of events." Truth. That brings me comfort too, even though like you, I wouldn't have knowingly chosen the path of suffering that he's led me through, but on this side of it, I'm glad he did. More faith for those future paths, Lord! Sounds like a great book. That phrase - "stir through the ashes" - that is a visual - to stir through and light a fire of faith! I like that! What an encouraging book! That sounds like an incredibly faith-building book. I constantly remind my self that we are to be thankful and joyful in all circumstance and suffering builds character and does good in God's great plan, whether we see it or not. There are reasons for what we go through in life. It looks like a wonderful book that I must check out! I wanted to say thank you for stopping by my site, I am looking forward to connecting and following your posts! What a opportunity for a good book! I was just reading the story of the coffee bean and how when we are put under pressure, we can produce something good. What a great review of what looks like an inspiring book. Will definitely check it out. Thanks for sharing at Essential Fridays. I'm a big fan of Carol's and pray for her family daily. Thanks for a great post. I have heard great things about this one, I'm so glad you shared your review on Cozy Reading Spot!